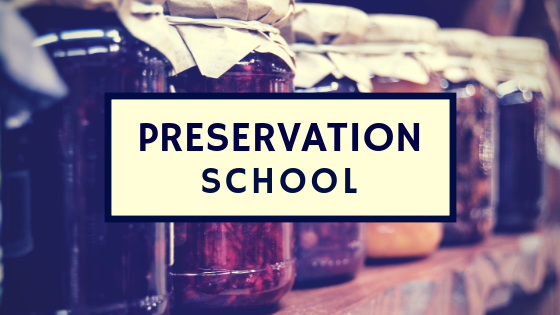 To register for a class, email me at amanda@preservationschool.com. Taught in the student’s home kitchen, these classes are for beginners and are designed for no more than 4 students, in order to maximize hands-on, personalized instruction. For larger groups, please see the Preservation Make & Take Party listed below. Instruction, produce, hand outs, and supplies are included in the course fee. Produce is sourced from local farms and the Woodstock Farmer’s Market. Learn how to make jam in this hands-on two-hour class. We will review how to prepare the fruit, cook the jam in order to get a perfect set, and then water bath can it to make it shelf stable. We’ll also review how to trouble shoot problems (such as runny jam or unsealed jars), how to store the jam and recipe ideas for using it in cooking. Learn how to make pickles in this hands-on two-hour class. We will review how to prepare the vegetables, create a brine, and then water bath can it to make it shelf stable. We’ll also review how to trouble shoot problems (such as soft pickles or unsealed jars), how to store the pickles and recipe ideas for using it in cooking. Learn how to make my award-winning salsa in this hands-on two-hour class. We will review how to prepare the fruit, cook the tomatoes, and then water bath can it to make it shelf stable. We’ll also review how to trouble shoot problems (such as unsealed jars), how to store the tomatoes and recipe ideas for using it in cooking. Preservation Make & Take parties are a fun way to combine a celebration with learning a new skill! Taught in the student’s home kitchen or facility, these classes are a combination of demonstrated technique and hands on learning. Instruction, produce, premium hand outs, and supplies are included in the course fee, in addition to a private Facebook event page for your party. I am also happy to incorporate student-provided decorations, theme materials, etc.. Produce is sourced from local farms and the Woodstock Farmer’s Market. Any of the courses above can be incorporated into a Preservation Make & Take Party, or I can work with you to design a completely custom class to suit your group.